for the computer on a 2002 ranger with a 2.3L engine. alldata and there is no location for it on there either. coolant sender for the guage . Ford's generally have either a Engine Coolant Temperature sensor or a Cylinder Head Temperature sensor but not both. Your 2.3 has a CHT sensor and no ECT sensor. [QUOTE=rwenzing]Ford's generally have either a Engine Coolant Temperature sensor or a Cylinder Head Temperature sensor but not both. Your 2.3 has a CHT sensor and no ECT sensor. [I went to the dealer to get one and they sold me one it is listed for the truck with a 2.3 and alldata lists them with the part # but they do not show a location and I can not find it on the motor if that is the case ford should do there home work before they sell parts for them . Last edited by whiteranger; 06-21-2005 at 07:06 PM. I went to the dealer to get one and they sold me one it is listed for the truck with a 2.3 and alldata lists them with the part # but they do not show a location and I can not find it on the motor if that is the case ford should do there home work before they sell parts for them . The dealer lists all three for my truck by vin # thats why I am asking for help from some one who knows about fords . Never mind. Forget what I said. Go find someone who knows about Fords. I know this is a really old thread. But I am looking at the factory manual for a 2002 Ford Ranger 2.3L and it lists both an Engine Coolant Temperature (ECT) Sender (Connector C1061 and goes to pin 19 on the PCM connector)...this is the one that controls the gauge and tells the PCM the temperature of the coolant so that it can open or close the electric thermostat. But the manual also lists a Cylinder-head temperature sensor (Connector C107 goes to pin 66 of the PCM connector). Both are specifically listed for the 2.3L. However there is no location for the ECT Sender connector or the component itself. Is this a misprint in the manual? The 2.3L ECT sender location is not at all clear in the 2001~2003 manuals other than the C1061 connector being shown somewhere near the rear of the engine. FWIW, the 2004~2006 has a slightly better picture that shows it behind the cylinder head. Look for a brown connector shell with red/white and black/white wires. Thanks. I think I found it. The gauge sending unit is on the metal coolant pipe on the rear passenger side of the engine. The top hose going to the radiator goes toward the back of the engine then becomes a metal pipe just as it turns to go behind the engine. After it goes behind the engine the sensor is there. Fairly hard to get to, but I think it is possible. The only way I could find it is by looking in the manual at the engine exploded view and it showed it behind the engine not far from the EGR valve. 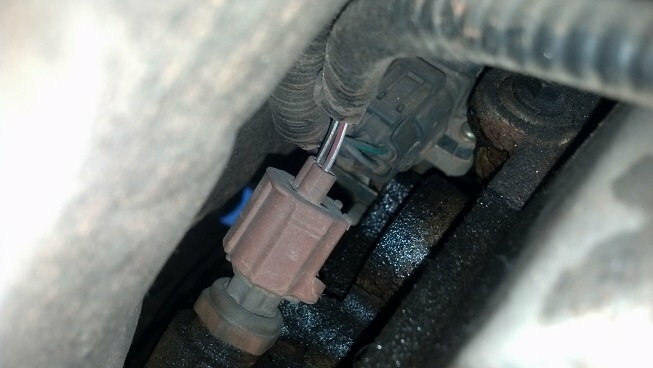 Then the cylinder head temp sensor is right on top in the middle of the spark plugs. Fairly easy to see, but looks hard to get too and looks like something that would break easily. 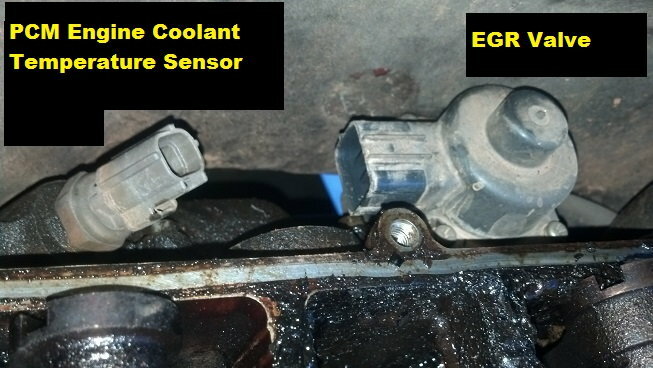 Has anyone been able to change out the ECT sensor located at the rear of the engine on the coolant pipe? I got to it, but it looks like the release button on the connector faces the engine and it's virtually impossible to get your hand between the engine and connector to release the connector. Does anyone know how the connector releeases (push, pulll, or what)? Will appreciate any help you can provide. I have changed the ECT. To release the connector you have to use a small flathead screwdriver. Push the tip down into the connector and pull. Use a 6 point deepwell 3/4" socket with swivel and extension. Very tight place but, you can do it. The Cylinder sensor uses the same type and size socket to remove. I replaced both and my temp gauge still will not register. The engine runs normal with heat at the heater but, no reading on the gauge...Does anyone have any ideas for me???? I changed the ECT engine coolant sensor and the CHT Cylinder head sensor and my coolant gauge on the dash reads below cool. My engine light is on as well. I have the electric thermostat that is mounted in a plastic holder. I took the truck to Advance auto and my codes are PO125 ECT - P1289 CHT - P1537 Mechanical condition valve stuck open. Can anyone help with suggestions? Should I changed out the electric thermostat? This version is $150 plus. Help!!! Do you have an part numbers on these parts by chance? Also do you have a picture of where the ECT sensor is... I'm trying to find it on my 2001 ranger but simply can't find it... also looking at rockauto they have like 10 different sensors... how does one know what they need?? The 2001~2003 2.3L DOHC has a VERY different cooling system as compared to other Rangers of the same vintage. However, it has two other parts that may cause confusion: The ECT SENDER and the CHT SENSOR. 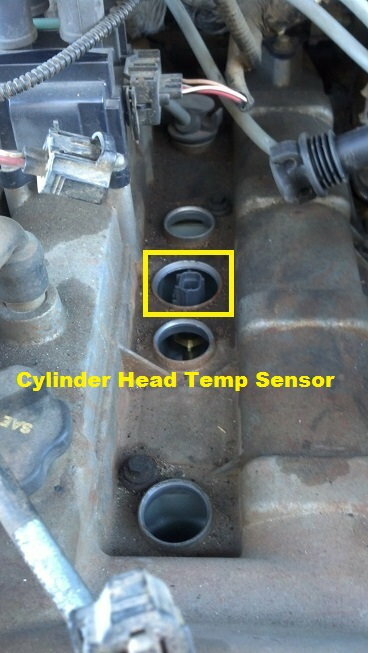 The Cylinder Head Temperature (CHT) SENSOR is an input to the PCM. 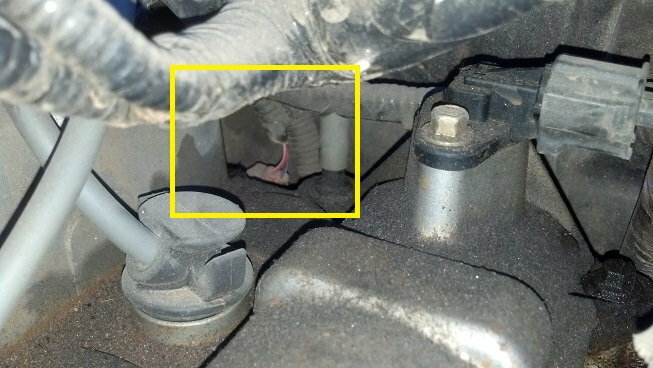 The CHT sensor should be buried under a cover between a pair of spark plug boots. The wire color codes going to it are yellow/light green and gray/red. The Engine Coolant Temperature (ECT) SENDER controls the temperature gauge under normal conditions. In the event of an overheating condition (as indicated by the CHT), the PCM may take over and force the gauge toward the top of its scale. The ECT Sender on your 2.3L should be in the cast coolant pipe assembly behind the rear of the cylinder head/cam cover. To verify, check for wire color codes red/white and black/white. FWIW - the electronic thermostat assembly is probably the most unreliable part in the 01~03 2.3L DOHC cooling system. It is also many times more expensive compared to a traditional t-stat. Sorry to say but it is more likely that it has failed instead of a sensor or sender. A side question that you might be able to help me on but what triggers the radiator fan clutch to engage and make the fan spin faster? I don't think mine has ever spun fast per-say... that's getting replaced tomorrow as well as I think that might be causing some overheating issues as well but is there a sensor somewhere the triggers that? When I looked at the clutch I didn't see any wires or connectors to it? The mechanical fan clutch has no wires. It contains a fluid inside that thickens as the temperature of the clutch housing rises. So, when enough heat rejected by the radiator warms the clutch housing, the clutch engages more and the fan speed increases. When it cools sufficiently, the fan slows. A unique feature of the 2001 and newer 2.3 DOHC Ranger is that it also has an electric cooling fan that is controlled by the PCM via a relay. Its operation is independent of the belt driven fan and clutch. Excellent information!! Thank you for explaining! I do have a question now since I have replaced the majority of cooling components. Such as the water pump and the thermostat housing, along witth the upper and lower rad hoses. When the truck is cold it takes some time for the temp to raise but it doesn't go higher... so my question would be where is the information for the temp getting it from the OBDII sensor? What is telling that part what the actual temp is? The Cylinder heat temp sensor in the middle between the spark plugs? Under lightly loaded conditions, your 2.3 DOHC engine runs hotter than most other engines. This is done deliberately because it increases efficiency and fuel economy. Let's ignore the temperature numbers for now. What are the symptoms that make you think something is wrong? Welp if we take the temp number out then I really have nothing to go off of as far as what the coolant is doing. However I started infrared probing the engine and it wasn't above 260 degrees... it was actually right at around 200. Same with the coolant overflow tank. I then took off the cap and stuck a temp probe IN the coolant and the coolant was about 200 degrees so it is in fact working... I ordered a new CHT sensor to replace. But it would appear that since the actual coolant temp isn't above 200 that it is in face going through the engine/rad and the thermostat is working as it should. I'll see once I get teh new temp sensor. But I guess eveything is now working as it should! Don't be surprised if you see coolant temperature above 200F when the engine is lightly loaded. That fancy electronic thermostat can allow it to go higher than what we usually think of as "normal" which increases efficiency and fuel economy. When the engine is under a heavier load, the PCM will make changes to bring the temperature down. Here' some pictures to help. I've found and replaced the Temp sensor that reports to the PCM, and the pictures that follow cover that, but I have not yet found the temp sensor that reports to the gauge on the dash. Once I find (any replace) mine I'll get pictures put up. 1. View of Cylinder Head Temperature Sensor (CHT). Top/center of valve cover between #2 & #3 spark plugs. 2. View of Coolant PCM Engine Coolant Temperature Sensor from the front of the engine. 3. Top view of PCM-ECT and EGR from firewall. 4. Removing valve cover in order to get better access to area. You can also see the results of me being a cheapazz with this truck on oil changes. 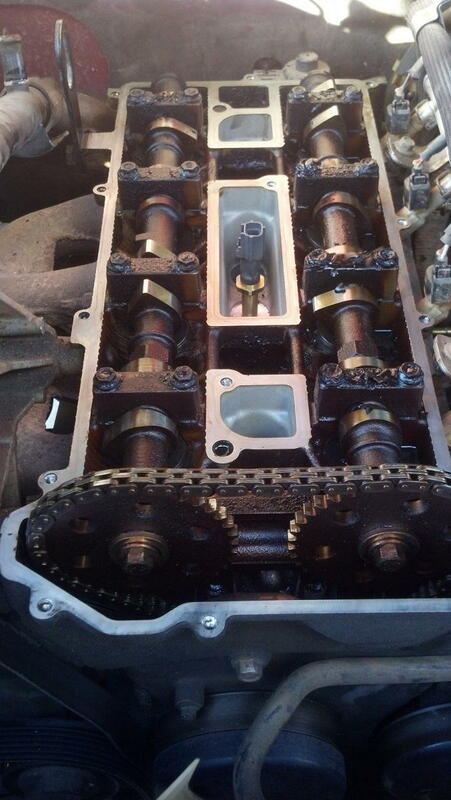 This shot was after I had cleaned up the valve cover mating surface. You can see in the next picture what it originally looked like when I got the cover off. 5. Took me a while to get the mating surfaces cleaned up because of my being lazy with this truck (about to do the first oil change in about 6000 miles) and the resulting sludge buildup in the engine. I guess I'm going to have to start putting some money in her now. Last edited by Tanker3278; 11-30-2014 at 10:13 AM. Here's another view from me doing my head gasket. Do we have a part number for the OEM ECT sender unit for a 2.3L? I want to replace this but I keep getting actual sensors rather than the sender unit. Not sure how to search /find a different one because most is coming up as an actual ECT sensor. This one ??? The link is for the sender (for the gauge). The sensor looks quite different. Last edited by Jeff R 1; 08-07-2018 at 06:20 PM. Going to order it and change mine out. I got a weird situation with my temp going down after about a 20 minute drive and then it comes back up after 10 or so minutes. I've replaced my thermostat and CHT but still have this weird finicky issue. Coolant Temp. Sensor NEED HELP ASAP!!! Quick Reply: Coolant sensor ?